This Case4Life DSLR Camera Case is the perfect way to transport your SLR Camera. The custom designed bag is designed to allow you fit your SLR / Bridge camera with long or short lenses. There is excellent padding all over the case to make sure your camera will remain safe, the nylon material is also water resistant so will keep your camera dry during rain showers. 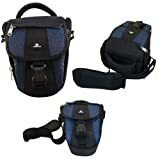 There is also a padded shoulder strap to allow you to comfortably carry your bag and has a number of internal and external compartments with space to store some of your smaller accessories. There is room to carry a SLR/Bridge Camera, SLR Lens (1 x Large or 2 Small), Spare Batteries, Charger, SD Cards, Cleaning equipment and much more. The inner dimensions of this case are 170/90 x 100 x 170 mm. This entry was posted in Discount Photography and tagged Black/Blue, Camera, Case, Case4Life, D3100, D3200, D3300, D3400, D500, D5100, D5200, D5300, D5500, D700, D7100, D7200, D750, D800, D810, D810A, DSLR, Holster, Nikon, Series by Ball Photo. Bookmark the permalink.